a small animal. Anybody know what's the name of this animal? Looks like a Tetrapodophis Amplectus to me. Tetrapodophis Amplectus was a 4-legged snake.It is from the Early Cretaceous period in Brazil. 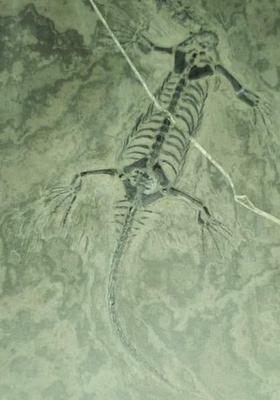 Nice fossil! Do you know where it came from? The head is difficult to make out in this photo. Is it present? Can you submit a close up of the head?